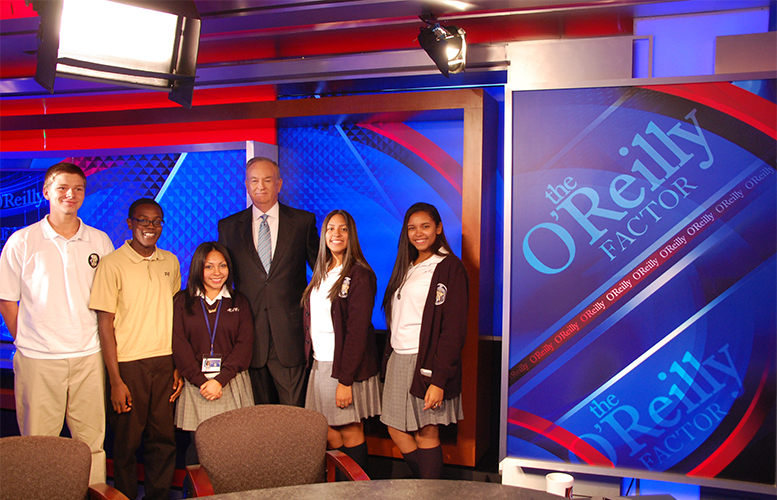 A group of city teenagers, who have all received scholarships to attend schools outside the city boundaries, spent about an hour hanging out on the set of the O’Reilly Factor, a talk show on Fox News, with host Bill O’Reilly on Tuesday afternoon. “We watched the taping of his show that’s going to air tonight,” said Ximena Cespedes (far right), 17, a city student attending Mary Help of Christians Academy, a catholic high school in North Haledon. Cespedes and her school mates Chrystal Donayre (second from right), 16, and Daisy Paisi (third from left), 17, received scholarships from the Tri-County Scholarship Fund to obtain an education outside the city’s failing schools. “We were in the video production room where the editing takes place,” said DeAndre Tomlinson (second from left), 16, a junior at Paramus Catholic High School. “It was pretty cool, we got to take pictures with him at the set,” added Jacek Bialy (far left), 16, who also attends Paramus Catholic High School. “He seems short when you’re watching him on TV, but he’s really tall,” observed Tomlinson. A typical parochial high school charges approximately $11,000 in tuition; similarly, a typical parochial grammar school tuition runs about $5,000. The organization has what it calls a “three legged approach,” where the fund, the school, and the parents contribute towards the child’s education, so that all parties have a stake. The fund boasts an impressive graduation rate for its scholarship recipients. Floyd said 98-percent of them graduate high school; and that same percentage also make it to college. Just in the past four years, recipients have been accepted into to Colgate, Cornell, Rutgers, Georgetown, UCLA, Villanova, Columbia, NYU and Notre Dame. Cespedes’ sister, after receiving an opportunity to attend a parochial high school, did so well she managed to obtain a full scholarship to the University of California, Los Angeles (UCLA), where she is studying chemical engineering. “Because she had a Tri-County scholarship that helped her be in a great parochial high school,” said Floyd. Cespedes said she is looking to attend a college in either Boston or Washington D.C.
At the reception area of the Fox News building in the Avenues of the Americas in New York City, the students expressed a great deal of excitement having been behind the scenes of one of the most popular talk shows on television. O’Reilly is set to be the guest of honor on October 20th at a fundraiser being held by the fund in Whippany, New Jersey. The president estimates $700,000 will be raised that night – the money will be used to fund scholarships. Tickets to the fund’s 33rd annual awards dinner can be purchased from its website – money raised is placed into the scholarships.